Once in a while, after you’ve played with all the new rifles long enough, a wave of nostalgia washes over you and leaves you beached by an old Mauser Œ98. I hit such a tidal wave recently.A colleague was wanting to find a good home for his father’s sporting rifle. At first I was nonplused: a 1916 wartime action, sporterized in the post-WWII style. Which means white line spacers on a Monte Carlo stock, Redfield apeture sights, bent bolt handle, and not much else. No scope, no hinged floorplate or svelte triggerguard, and the issue safety and trigger. Ugh.Oh yeah, .35 Whelen. Oh man, big snore. I tried to sell it for him at few gun venues, but no one wanted it. It was a piece of obsolete machinery that for the price of the gunsmithing it needed, you could buy a factory new gun. Few such custom jobs have much resale value….. where’s the warranty? To shorten up, I took the rifle for a very fair price (fair to me at least) and had it sporterized further. Leupold 2-piece scope bases. Bold adjustable trigger. Scalloped bolt handle and polished bolt. New recoil pad. Buehler-style 2-position safety. Parts and all, $200 including tip. So now I had a .35 Whelen on an 85-year old action. What to do, but shoot it. New RCBS dies and a boatload of .30/06 brass got me started. I had Hodgdon VARGET powder on hand already, and although Hodgdon BL-(C)2 gives the highest velocity, I like to simplify. Scanning the loading manuals, I bought a box of Hornady 250 grain spirepoints. That’s 100 bullets for you “super-premium” users.One nice aspect of this happenstance is that I’ve finally got a rifle designed for the modern reloading manual. In case you’ve never made the comparison, the modern reloading manual of the past 10 years is designed for rifles made prior to WWII. The publishers don’t tell you this, but the loads are so watered down that even if your rifle was manufactured last year to fire a modern magnum cartridge, you won’t be getting it’s full potential. Go pick up a older manual and note the difference. In this age of everyone being afraid of being sued because of someone else’s stupidity, I’m surprised reloading components are even sold. (Note: Trial lawyers, call your offices.) I can almost imagine the reloading companies trying to buy up all the old sensible manuals to get them out of the hands of shooters.At any rate, the headspace was perfect on my rifle and the barrel and action appeared sound. Nonetheless, I decided to limit the pressure to 50,000 C.U.P. 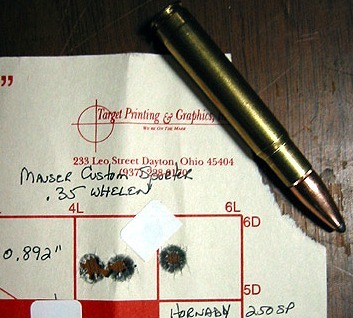 Hodgdon listed a load of VARGET with the 250 grain bullet at 49,900 C.U.P. Perfect. The .35 Whelen is nothing more than a .30/06 necked up to .358 calibre. It was named after rifle authority Townsend Whelen, but designed by a co-worker at the U.S. Springfield Armory (the real one, not the latter-day commercial company) around 1925, in his honor apparently. Remington makes commercial cases, but you can form your own using .30/06 cases simply by passing them through a .35 Whelen die. I like that method… it’s more nostalgic. Even a full case of powder in the .35 Whelen doesn’t need a magnum primer. I use Winchester WLR for all my loading. At one time, before they made a dedicated magnum primer, the WLR was advertised for “standard and magnum” loads. It is the hottest of the standard large rifle primers. Picking a bullet for this oldtimer takes a little thought. Even at the SAAMI standard of 52,000 C.U.P., a 250 grain bullet only gets 2550 fps max in a 22″ barrel. 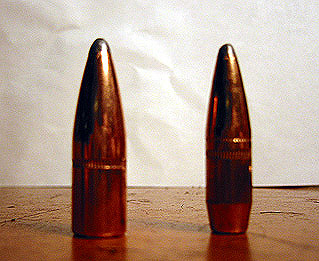 A 225 grain bullet can reach 2700 fps and a 200 grainer up to 2850 fps. In spite of their higher velocities, the lighter weights don’t “measure up” to the 250 grainer. Take a look at the energy and drop figures. The higher ballistic coefficient and sectional density of the 250 grain spitzer bullets, while started out slower, differ only 2″ in drop at 300 yards from the lighter faster bullets. Yet energy of the 250 grain bullet is significantly higher. The other aspect is that the penetration of the 250 gain bullet is far better than the lighter jobs. Which brings up the point of what are you going use this thing for anyway. Despite its relatively low velocity for a bottleneck cartridge, it is remarkable efficient. It is really made for the heavier (500+ pound) animals, and the 250 grain bullet is best. By necessity, it is a short-range cartridge, due to its 2500 fps maximum velocity with that bullet weight. By short-range I mean a little over 200 yards or so for sure hitting. But you would be hard pressed to get even 2400 fps from the parent .30/06 with a 250 grain bullet at the same pressure. If you have other smaller calibre rifles, there is no advantage to using the Whelen on deer and such light game. But if the Whelen is your only rifle, then you can also load a 200 grain bullet for deer hunting. If 200 grains sounds heavy, remember that it is a relatively short bullet, and although it will strike a heavier blow, it will penetrate LESS than a 200 grain .30 calibre bullet. So it is best for deer in this calibre. At 2750 fps, it flies faster than a 200 grain .30/06, and shoots flat enough for 250 yard shooting. I haven’t seen the point of the compromise 225 grain weight, as this really isn’t much of a compromise calibre to begin with. For me it¹s neither here nor there, but there are those who like it, especially in the Nosler Partition bullet.